Over the last 31 years, the American Venous Forum (AVF) has led the field of venous and lymphatic disease by raising awareness of the spectrum of venous and lymphatic disorders and providing the highest quality evidence-based knowledge to the current and next generation of venous health care providers in order to improve the treatment options and care of patients with these diseases. AVF continually influences the field through cutting-edge research and educational programs, the premier of which is the AVF Annual Meeting. We cordially invite you to join us at the 31st AVF Annual Meeting, scheduled for February 19-22, 2019 at The Westin Mission Hills, Rancho Mirage, CA, to meet with over 400 attendees and associates from the United States and around the world. 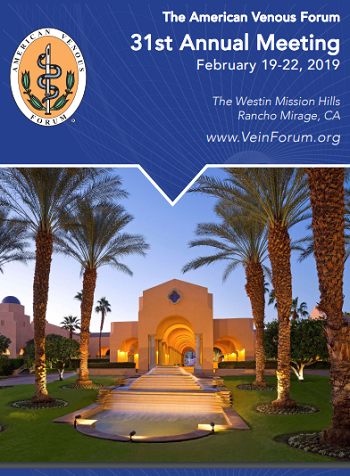 Exhibiting at the AVF Annual Meeting will provide your company the opportunity to engage and network with internationally recognized thought leaders, expert investigators, and clinicians in the field of venous and lymphatic health care. The AVF Annual Meeting attendees are interested in learning about and utilizing your products and services to increase their treatment options and improve patient outcomes. This event provides an unparalleled opportunity to build and solidify relationships through one-on-one discussions and focused marketing.